Just read somewhere that an 'artist' has created a new exhibition of drawings by masturbating over paper. Controversial performance artist Jordan McKenzie, 40, has made 55 images by ejaculating over canvas and sprinkling carbon over the results to immortalise them. 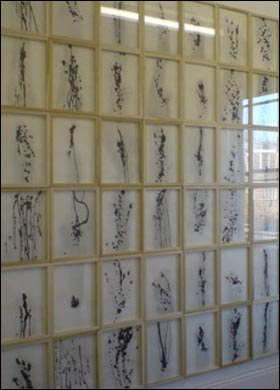 The results of his labour entitled Spent are to go on display at the Centre for Recent Drawing in Highbury, north London, for a month. Here's a picture of how his ejaculations look like. All i can say is...... it sure stinks. The pictures would be nice if they were just black paint sprinkled on paper. But when you think about the fact that those 'paintings' are made from the guy's liquid, all nice thoughts of it flies away in a second. I wonder who would buy it and hang in their house.